And while you're at it, you'll need to take a look at Speed-O-Guide (commonly called 'Red Guards'), the original red comb inch used for virtually every clipper model on the market today. Adjustable hair clippers have their kings, but detachable clippers for barbers have one emperor–and that is the Oster Classic 76. Every Classic 76 blade is made of the highest quality stainless steel with up to 1.2% carbon inside. This allows for not only tougher and sharper performance but also makes these accessories last way longer than your usual clipper blade.​ Oster ensures this by putting its products through a rigorous testing process of either scorching heat or freezing temperatures to create superior durability. The result is an insanely solid, long-lasting, and an ultra-tough blade that cuts through any hair type with zero effort. A knife blade of tremendous quality will rank around 55 to 60 on the Rockwell scale. Oster 76 blades can take pride in a 62 to 66 score. 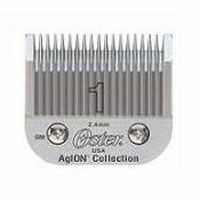 Oster 76 clipper blades are used for close cuts, including a complete shave (if you choose the tightest 00000" version), resulting in a totally bald look. Also, The masterful art of producing and strengthening any Oster 76 blades set is outstanding. I doubt there’s something as meticulous as their creation. Andis offers a variety of professional grooming blades for dog owners. The full line of Andis blades includes CeramicEdge, ShowEdge, UltraEdge, large animal, and trimmer blades. There are also 5-in-1 adjustable blades. These blades are constructed of carbonized steel for long edge life and have a chrome finish that resists rust. Several of the Andis clipper blades are interchangeable with other Andis products as well as certain Oster and Wahl clippers–which I consider a real bonus. Tip: Remember to always oil your blade before and after each use. Wahl, a company that has been around for over a century, makes carbon-steel professional blades that will give you the precision cut you are looking for every time. Wahl's trimmers are best for detailing, lining, and finishing a cut–along with the removal of facial hair. Their clippers, on the other hand, will quickly tackle those large sections of your hair with precision and ease. 1 - 1/2 - 3/16"
Speed-O-Guide is the original red comb inch for use with virtually all clipper makes and models. Available in seven sizes, Speed-O-Guide's superior quality plastic combs will ensure both flexibility and strength for a long period of time. If what you're going for is the latest look in a flat top, crew cut, or buzz cut, then Speed-O-Guide is what you're looking for.